The PS480 is the first manual push sweeper from Viper, offering you a robust and highly productive cleaning solution which is easy to use and available at a competitive price. The compact design and construction add cost-effectiveness to the well-known Viper quality, as the sweeper is built on a rugged frame, and the brooms are rotated via a belt drive or by a simple two-wheel transmission with very little need for service since no motor, battery or power cord will require your attention. 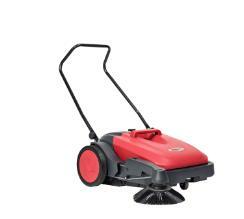 You can focus on the cleaning job, and the sweeper offers great capacity with its 38-litre hopper. While pushed to clean indoor floors or outdoor areas, the Viper will sweep away and pick up paper, leaves, bottle caps, corks, cigarette butts - even small screws, and nails, etc.